The lavish, shaped stand-up shoe card measures a full 23 cm or 9 inches for a very realistic look. It will also make a super cake topper or table decoration. A real luxury card! The second card is fold card 7 x 5 inches and includes a Rose Dot paper sheet to wrap a small gift. There are optional decoupage layers and a variety of tags, and two-part envelope for both cards. 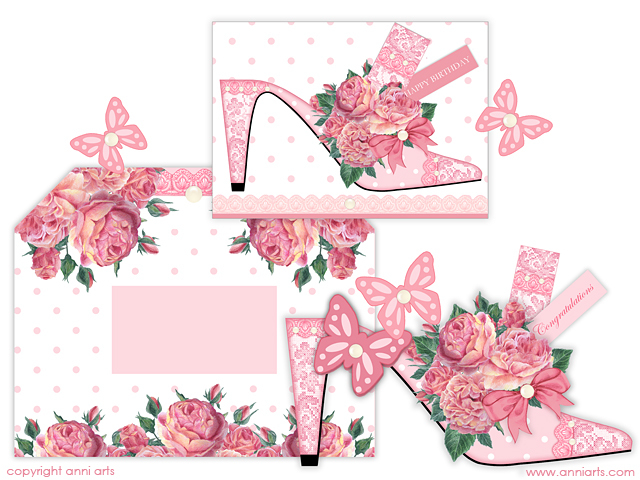 This set coordinates with the June birth flower and gems printables and the Summer Rose items, but are neutral in application.